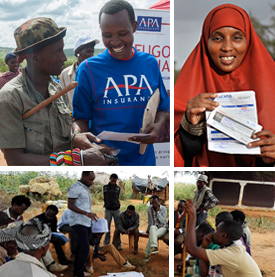 A new policy report published by RESULTS UK this week, highlights the Index-Based Livestock Insurance (IBLI) Program in Kenya, as one of the initiatives that are successfully reaching vulnerable people with climate risk insurance in developing countries. The report, which was launched 11 May 2016 ahead of the World Humanitarian Summit, highlights ‘unprecedented opportunities for donors to reach an additional 400 million vulnerable people with climate risk insurance by 2020 through the G7 “InsuResilience” Initiative’. It brings together a weight of evidence about the protective, promotive and transformative effects of insurance in building climate resilience. The report also includes a series of case-studies demonstrating the real impacts of cutting-edge weather-based insurance programs. Experiences from IBLI in Kenya, were used by the government in Kenya to launch the ‘Kenyan Livestock Insurance Programme’ which is covering small-scale farmers and herders against weather-related crop failure and loss of livestock. Read the whole report: Weathering a risky climate: New policy report launched by RESULTS UK. Tags: Policy, RESULTS UK. Bookmark the permalink.